What's on your mind, Zuckuss? Honor the bounty hunters of the Star Wars Universe! Lithograph spotlights the insectoid Gand looking quite eerie and menacing. 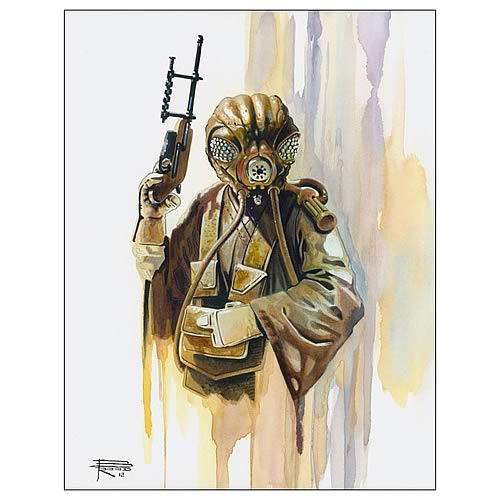 Fine-art print from Acme's Star Wars Bounty Hunter Collection. Limited edition of a mere 250 pieces! Honor the Star Wars characters that never seem to get any love... the bounty hunters! This Star Wars Zuckuss Bounty Hunter Collection By Brian Rood Art Lithograph shows the insectoid Gand looking quite eerie and menacing in his signature respiratory gear, with blaster pistol relaxed but at the ready. The highly artistic print by Brian Rood goes well with the rest of Acme Archives' Bounty Hunter Collection lithographs that feature the scourge of the galaxy (sold separately). A limited edition of a mere 250 pieces, the Zuckuss Bounty Hunter Collection Lithograph measures 15-inches tall x 12 1/2-inches wide.